Barn owls aren’t as widespread in the UK as they once were, diminishing suitable hunting habitat as a result of modern intensive farming methods being just one of the reasons. However, if you go to the right place at the right time of day, you have a very good chance of seeing them, and it’s always a complete thrill when you do. We have Barn Owls here in west Wales, and if you’re lucky you might see one coursing across a field or hay meadow on a warm summer’s night. 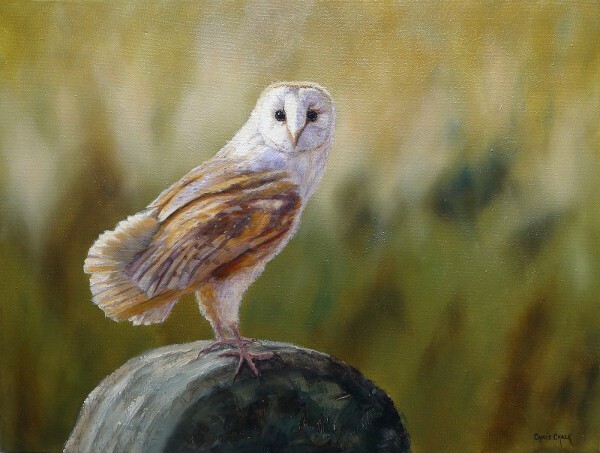 I’ve painted Barn Owl paintings in the past, but having seem some photographs a good friend took of a Barn Owl recently, I thought it was about time I painted a new one, this time something a little larger. 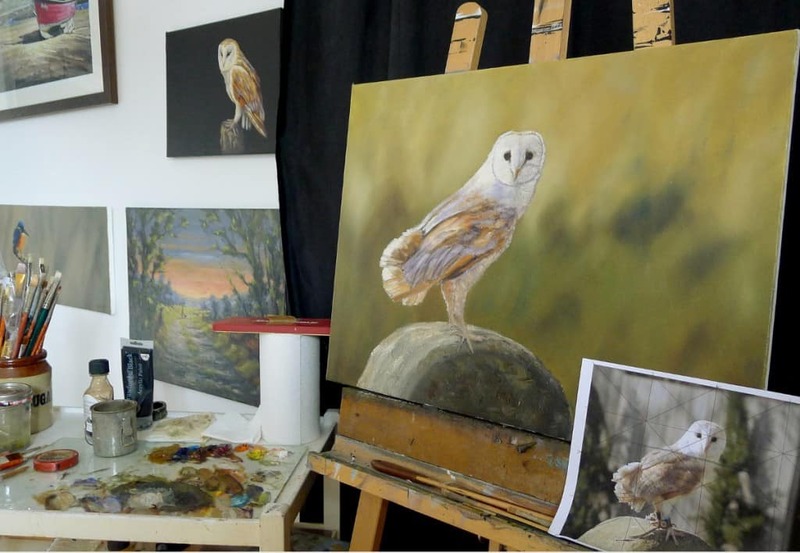 You can see the Barn Owl photograph I’m using for reference in this image, it was taken at a birds of prey event by my friend and fellow artist Karen Berisford, as you can see I completely changed the background to the original one in the photograph. To paint the background I applied quite think paint using a palette knife where I wanted certain colours, then I used a fan-brush to soften and blend any edges, which then gives that fuzzy, slightly out of focus look. In this second stage the painting is almost complete, bar a few tweaks and a signature. 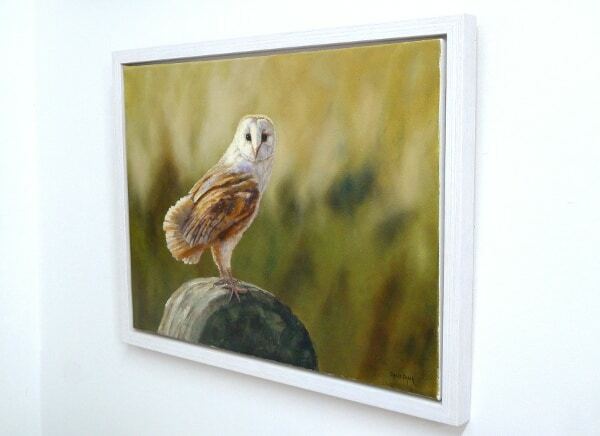 Here’s the finished barn owl painting, and a photograph of the painting framed in a white floating frame, and hanging on my studio wall. 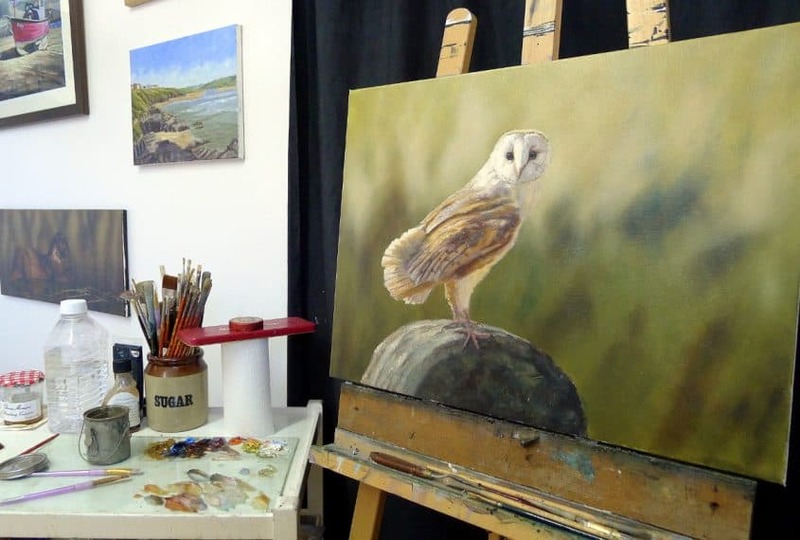 Find out more about this barn owl painting here. ..there’s also Cadmium Orange on my palette above you’ll notice, but I didn’t use it. For thinners, I just used Liquin – a Winsor & Newton product that also speeds drying time. To clean my brushes I simply use white spirit. Find out more about the painting equipment I use here.